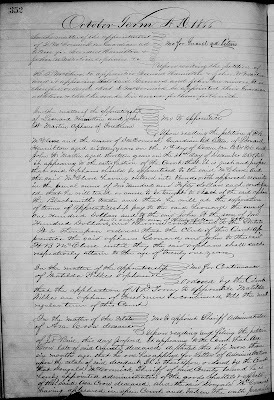 "Mississippi Probate Records, 1781-1930," images, FamilySearch (https://familysearch.org/pal:/MM9.3.1/TH-1961-30945-427-6?cc=2036959 : 21 May 2014), Jefferson > Minutes 1862-1870 > image 184 of 440; county courthouses and public libraries, Mississippi. My friend and colleague, Annette Bowen found some interesting documents that tell a story of African American children being apprenticed within months of emancipation. Here is her note to me. I was looking through Jefferson County Mississippi Probate Court Minutes for the year 1866 and stumbled upon numerous items referring to apprenticing children. Many of the applications gave the age and birthday. Most of the children seemed to be "freedmen" so I assume they were children of slaves, newly freed. Most said they were orphans but a few said their mothers had given approval. Some specified that they would learn a trade like blacksmith, but most didn't. Girls were apprenticed to age 18 and boys until age 21. I don't remember seeing these before and thought you might be interested. Indeed I am interested! Thank you Annette! Here is one of the URLs that have apprenticeships. You need to be signed in to Family Search for the links to work. Leonard Hamilton was aged sixteen years on the 31st day of December A.D. 1866 and John W. Martin aged thirteen years on the 31st day of December 1866. Matilda Wilkes is also mentioned as the orphan of Freedmen on the same page. 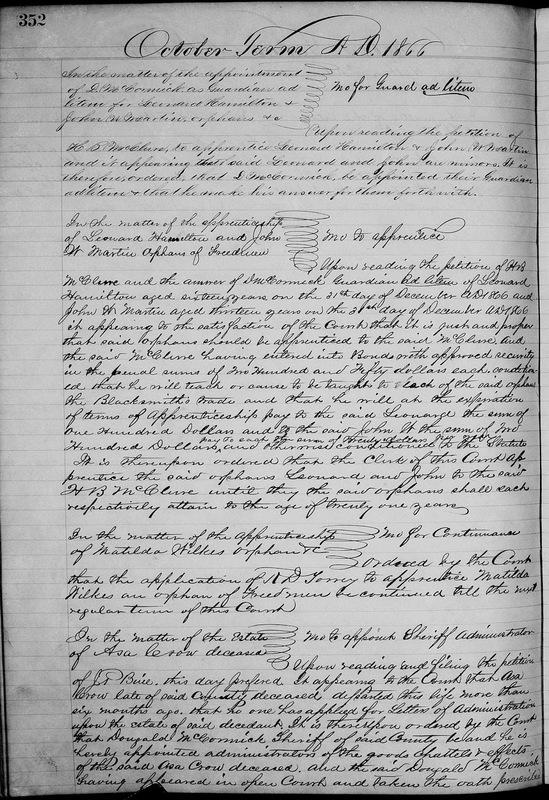 Attempts to locate Leonard Hamilton born about 1850 in Jefferson County, Mississippi in the 1870 census using full name, last name only and first name only were unsuccessful. Attempts to locate John W. Martin born about 1853 in Jefferson County, Mississippi in the 1870 census using full name, last name only and first name only were also unsuccessful. He had apprentices residing with him in 1870 but they were all white. Anna Darden was found in the 1870 census of Jefferson County, Mississippi but the young black people that were listed near her did not have names in the census. There were several black families listed near the Griffings and the Herrings. The similarity of the names Herring and Harrington are notable. There is an eighteen year old black male named Addison Bruin? on line 27 of the previous page of the census. I have heard of this apprenticeship process occurring in other localities. This could be a great opportunity to uncover more buried records on African Americans in the reconstruction period.